ABUJA—AHEAD of the 2019 general elections, President Muhammadu Buhari, yesterday, picked his expression of interest and nomination form to contest in the forthcoming primary of the ruling All Progressives Congress, APC. The form, sold for N45 million, was purchased on his behalf by one of his support groups, the Nigerian Consolidation Ambassadors Network. Many pro-Buhari groups had lobbied to be the ones to purchase the form for the president. With the purchase a day after the APC leadership made public the primaries time tables and the cost, President Buhari became the first aspirant to obtain the nomination form. The group, which was received by the party’s National Working Committee, NWC, came in hundreds to the national secretariat of the ruling party. Sunusi said: “Mr. Chairman, it is my singular honour and rare privilege to present to you a cheque of N45 million as payment for the expression of interest and nomination forms for President Muhammadu Buhari. “We have no doubt that Mr. President has both in action and word being working hard to lay a foundation for greater and prosperous nation that our generation and future generations will be proud of. 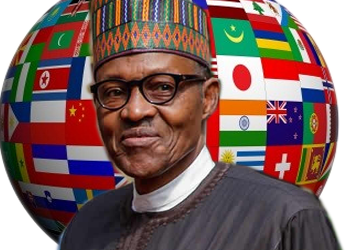 Under his administration Nigeria has become a country sought after for investments in the world; Nigeria has assumed its leadership role in not just Africa but the world. “Today, Mr. Chairman, Nigeria‘s moribund infrastructure is being revived. Mr. Chairman, for the first time since the return of democracy, Nigerians have a President who can beat his chest and state that he has never stolen from the purse of government.